Welcome to my free online solitaire games page. Below are lots of solitaire games you can play in your brower for free, anytime. 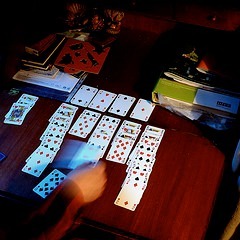 Solitaire card games train concentration, memory, and logical reasoning skills. The word "solitaire" has different meanings. This page has what those in the U.S. consider solitaire card games. The British refer to them as Patience card games. The solitaire games on this page start with a designated layout of cards. Your goal is to place the cards in a particular order, often by number or suit. Klondike solitaire rules are perhaps the most well known. The games below each have their own twist, though. This variety makes the games more interesting. If you grow tired of playing one, try your luck with one of the others. About This Game. Algerian Patience provides an interesting twist to the standard patience card game. In Algerian solitaire, there are 8 foundation piles and six draw piles. You can build up or down on the foundation and tableau piles, but only by suit. Play free now. About This Game. Like most card games, this solitaire game trains concentration and visual memory. This version is played using modified Klondike rules. Because these modified Klondike rules are somewhat lenient compared to strict Klondike games, you have a good chance at winning each round. Play free now. About This Game. British Constitution solitaire is an unusual type of card solitaire where you promote citizens to government. Give it a try! The cards on the bottom row are the citizens. The cards on the top row (the foundation piles) are the government. The second row, right below the government row, is the privy council. Play free now. About This Game. Remove the pyramids of cards to show a beautiful castle image. This game doesn't use foundation piles. Instead, match face-up high/low cards from the pyramid piles to the face-up card in the Discard pile. This version of solitaire is easy to win compared to certain others such as Forty Thieves. If you're new to solitaire, you'll enjoy Castle Solitaire. Play free now. About This Game. Crescent Solitaire is an unusual twist on the typical card solitaire game. Draw pile cards are separated into stacks in a "crescent" shape around the foundation piles. The object of the game is to move all of the cards from the outer piles onto the central foundation areas. There are 2 foundation areas for each suit. That's not the only difference compared to regular solitaire. In this game, build up 4 foundation piles, and ALSO build down 4 foundation piles. Play free now. About This Game. Here's a fun variation of regular card solitaire. The cards in Crazy Quilt Solitaire are dealt out randomly in a woven quilt pattern. The cards alternate from sideways to vertical which makes the pattern. One look at the screen, and you'll see what I mean. In a tip-of-the-hat to mahjong tile games, only cards with a short edge free can be removed from the table. If both short edges are blocked by another card, then that card can't be removed yet. Play free now. About This Game. As with other patience solitaire games, sort all the cards into piles based on suit. However, Forty Thieves solitaire is one of the hardest variations. Winning requires more skill than luck. See bottom of page for tips on how to win at Forty Thieves solitaire. Play free now. About This Game. This online Freecell Solitaire game is perfect for those new to card solitaire. Freecell Solitaire is designed so that almost every hand can be solved. The four "free cells" allow you to move cards around easily. Sort the cards from the tableau piles at the bottom into Ace through King stacks in the foundation piles. Play free now. About This Game. Gaps Solitaire is an interesting variation of solitaire where you fill in holes in the pattern as you try and get the cards into proper sequence. I found this version of solitaire puzzling at first and a bit tricky to master. Play free now. About This Game. Welcome to Golf Solitaire. This free solitaire game is a bit different from patience solitaire. Your goal is to remove cards from the tableau pile to the draw pile. But you can only move cards that are one point higher or lower than the face-up card in the draw pile. It's a challenge! Play free now. About This Game. Looking for a different type of card solitaire game than the usual? Try this one, Last Spy Solitaire. Clear matching pairs of playing cards before the timer runs out. This game has a Soviet theme, of all things. And 20 levels of solitaire for you to solve! Play free now. About This Game. To play Pyramid Solitaire, remove cards by clicking two cards that add up to a score of 13. The cards are laid out in the shape of a pyramid, and you have only three minutes to clear the board. If you get stuck click the NEW DEAL button to reshuffle the cards. You can reshuffle the cards up to two times per game. Play free now. About This Game. Ronin Solitaire is a variation of the traditional solitaire game played with a 52-card deck. In this version, the starting card from which you build your stacks varies (Jacks, Queens, Kings, or Aces). If you get stuck, click the Shuffle button to reshuffle the cards in the Shuffle pile. Play free now. About This Game. This remarkable online solitaire game includes 9 games in one! Play variations of basic solitaire, spider solitaire, freecell, scorpion solitaire, and more. All in one online Flash game. Each of the solitaire games includes an Undo button and Autoplay feature. This very nice solitaire game loads fast and is lots of fun. Play free now. About This Game. Rearrange cards into groups of 13 from King to Ace to clear the board. This version of Spider Solitaire comes complete with spooky music and sound effects, and pictures of spiders on the backs of the cards. When you begin, the cards are dealt into 10 piles (also called tableaus). The first four piles have six cards, while the remaining piles have five cards. Play free now. About This Game. Remove cards one value higher or lower than the up-card to clear the solitaire board. For example, if the discard up card is a "10", then any "9" or "Jack" up card on the solitaire board can be removed. The suit does not matter. There are 25 levels to complete, so Sheriff Tripeaks can keep you occupied for a long time! Play free now. About This Game. Valentine Solitaire is a free online solitaire game that's actually 9 card solitaire games in 1. Yes, in this one game you can play Klondike Solitaire (1 card and 3 card), Freecell, Spider Solitaire (1, 2, or 4 Suit), and Scorpion, Wasp, and Yukon versions of solitaire. All with a Valentine's Day holiday theme. Fun in February or any time of the year. 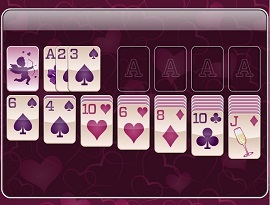 As you'll see, this valentine solitaire game has valentine hearts and other Valentine holiday images all over it. The background has hearts, and even the cards themselves have the Valentine's Day theme. Play free now. 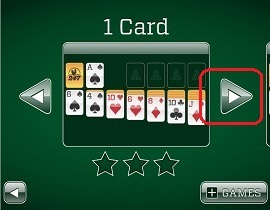 The free online solitaire games above offer many variations on how the cards are layed out and played. But most of them share a common goal. For most of the games, the idea is to rearrange the "up" cards into a certain order based usually on numerical order or card suit. Most use only a single 52-card deck. There will usually be a draw pile of some kind. The cards in the draw pile are face down, and you can turn over the top card when needed. Some of these free online solitaire games are on a timer. The faster you complete the game, the more points you get. For example, in Tripeaks solitaire, there is a timer bar that decreases until you make your next play. The faster you make your moves, the more time you can build up. You may not have realized it, but patience card games like these free online solitaire games have a long history. The earliest reference to the game of patience dates back to the late 1700's in Germany. Want to test how strong you luck is at the moment? Play a few hands of patience to find out. In old times in Scandanavia and Germany, people would play patience solitaire to see if the time was right to act or what the future would hold. Almost like looking for a sign from Lady Luck. If it took them a lot of tries to win, then their luck was not favorable. If, however, they completed a game right away, it meant their luck was good at that time. If you believe in luck, then maybe these free online solitaire games are a good way to test yours!